Astronomers Chadwick Trujillo and Scott Sheppard have discovered a new distant object beyond the Kuiper Belt, similar to Sedna. 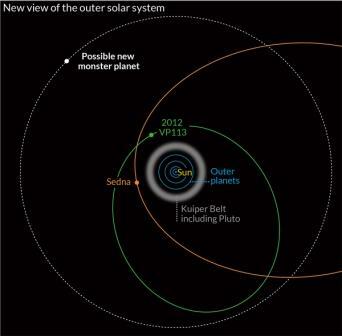 2012VP113 is 450km wide and is orbiting the Sun at 80 Astronomical Units (1), making it the second most distant object in the solar system discovered so far (after Eris (2)). What's really exciting about this discovery is its orbit. Sedna, 2012VP113 and almost a dozen other Kuiper Belt Objects are aligned in an odd way compared with other objects in the solar system. The implication of this is that there may be another large planet well beyond Pluto affecting their orbits. "One explanation for the alignment could be the tug of a rocky planet that is 10 times the mass of Earth that orbits the sun at 250 AU, the team calculate. That world would be cold and faint – and would push and pull at the closer objects like a distant but powerful puppeteer. NASA's Wide-field Infrared Survey Explorer (WISE) scoured this region of space in 2010 and 2011 searching for a so-called Planet X and came up empty. It's a strange thing, because one of the arguments made against an undiscovered Planet X is that the telescopes available now are so powerful that it is surely not possible that they could have missed a planet ten times more massive than Earth? Yet, as is indicated above, it is indeed possible at the kind of distances we are discussing here. There are likely to be a lot more of these inner Oort Cloud objects discovered in the future. It's been 10 years since Sedna was discovered, and at the time Sedna also hinted at a more distant object (4). But Sedna was only one object. 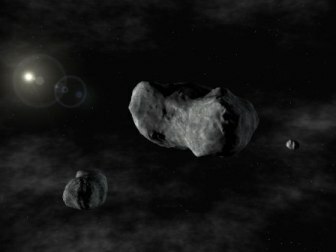 With two objects, we now have increasingly compelling evidence that an unknown major body affected the outer solar system in the past. Of course, there are other possible explanations for these unusual orbital alignments in these very distant outer solar system bodies. It may have been a passing star. It may have been an ejected planet, or early binary companion. Or, it may have been Planet X, which may still be out there affecting these orbits 4.5 billion years later. Despite this disappointment regarding hopes for a sub-brown dwarf companion, leading outer solar system astronomers seem to be admitting that a massive rocky planet 250AU from the Sun could have been missed by WISE. If Sitchin was right all along I would be so delighted. It would have to be a pretty cold rock, though - however massive - making the life issue a bit of a problem for those hoping to find the Anunnaki on an habitable world with an atmosphere at this distance. Nevertheless, Planet X is Planet X, and it's possible that a brown dwarf lies way out there at the edge of the solar system as well. This announcement could be a game-changer. "A new analysis of data collected by NASA's Wide-Field Infrared Survey Explorer (WISE) spacecraft revealed no sign of the mysterious Planet X hypothesized to exist in the outer solar system. But scientists are keeping up the search for a planet or dim star far from the sun. ANALYSIS: Is 'Planet X 2.0' Lurking Beyond Pluto's Orbit? Although astronomers are always keen to publicly distance any talk of Nibiru from their academic studies about potential additional planets in the solar system, it is pretty clear that the more mainstream news outlets see no need to make such a distinction. It it looks like a duck, walks like a duck and quacks like a duck, then it's a duck. I should also add that a contact I have in the academic astronomical community recently spoke with Professor John Matese, who also remains hopeful of finding a companion object (2) - although his estimate for its distance has shifted further away from the Sun, closer to that of Dr John Murray's proposal. Both men published academic papers in 1999 arguing that such an object (which John Matese names 'Tyche') is responsible for non-random distributions of long distance comets. A host of exoplanets have been discovered in recent years, and this would appear to be the best candidate yet for life outside the solar system. Similar discoveries of planets orbiting around brown dwarfs, or even smaller dwarf 'stars', are likely to come in the future when space-based telescopes have gained sufficient power to analyse the very fine data from these minute systems. 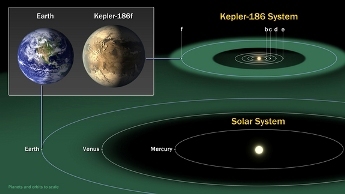 I am confident that it will become apparent that habitable, Earth-like worlds are also common in these tiny dwarf systems, both in their own right and as binaries to much larger parent stars. "Researchers theorized the presence of an interior reservoir of liquid water in 2005 when Cassini discovered water vapor and ice spewing from vents near the moon's south pole. New data on the moon's gravity field reported in the April 4, 2014, edition of the journal Science strengthen the case for an ocean hidden inside Enceladus. "The gravity measurements suggest a large, possibly regional, ocean about 6 miles (10 kilometers) deep, beneath an ice shell about 19 to 25 miles (30 to 40 kilometers) thick. The subsurface ocean evidence supports the inclusion of Enceladus among the most likely places in our solar system to host microbial life. Before Cassini reached Saturn in July 2004, no version of that short list included this icy moon, barely 300 miles (500 kilometers) in diameter. It is clear from this that before 2005 theory did not predict that tidal heating would produce sub-surface oceans in tiny moons like Enceladus, located so far away from the Sun's warmth. Is it possible that similar scenarios might play out on some of the moons of Uranus, and even distant Neptune? After all, scientists only became aware of this possibility because of the plumes of water streaming into space, as spotted by the Cassini probe as it viewed Enceladus. 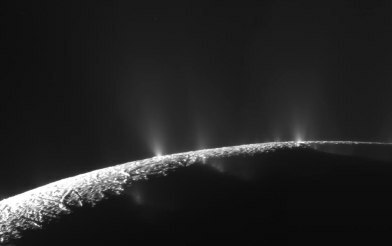 Without those spectacular geysers, I suspect scientists would still be in the dark about the tiny moon's sub-surface ocean. So what of it? Clearly, oceans on these moons are more common than expected. We know they exist around the gas giants. But the solar system has only two types of planet so far discovered: gas giants, and rocky worlds of Earth-size or smaller. Now astronomers are speculating about a 10-Earth-mass planet beyond the Kuiper belt, but we have no precedent for determining whether a moon around such a world might also harbour a sub-surface ocean. After all, this newly proposed Planet X lies in the middle of the spectrum of solar system planets; a spectrum of which we currently understand only the extremes. My point being: perhaps we don't actually need a sub-brown dwarf to create a habitable, sub-surface environment on one of its moons? Perhaps a binary planet system composed of a 10-Earth-mass planet with a 1-Earth-mass planet in a close but eccentric orbit around it would also suffice? The problem here is that a habitable atmosphere would still be out of the question, and that dwelling on such a world would be strictly subterranean in nature. "Linguists Dr Robert Ritner and Dr Nadine Moeller from the University of Chicago’s Oriental Institute believe the unusual weather patterns described on the Tempest Stela were the result of a massive volcano explosion at Thera – the present-day island of Santorini in the Mediterranean Sea. Because volcano eruptions can have a widespread impact on weather, the Thera explosion likely would have caused significant disruptions in Egypt. The new translation suggests the Egyptian pharaoh Ahmose ruled at a time closer to the Thera eruption than previously thought – a finding that could change scholars’ understanding of a critical juncture in human history as Bronze Age empires realigned. The 'weather report' on the Stele reports a 'tempest of rain' and dead bodies floating down the Nile like 'skiffs of papyrus'. Egyptology is notoriously conservative, and it may be some time before it accepts this new translation as evidence that the dating of the reign of Ahmose (and, by extension, all the rest) needs re-configuring. 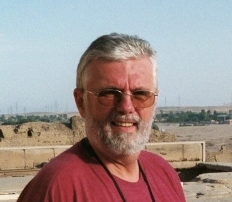 Rogue historians, like David Rohl (3) and Immanuel Velikovsky (4), have famously argued for a rethinking of accepted chronologies, with little success impact among mainstream Egyptologists. But perhaps this is different: the radiocarbon dating of the Thera volcano is solid enough, and it's hard to explain the ancient Egyptian description of this deadly cataclysm any other way. 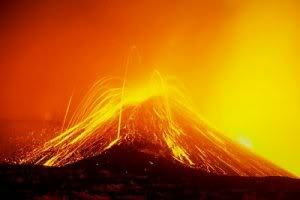 Many have argued that this volcanic explosion precipitated the events of the Exodus. If so, then it would appear that the Biblical Pharoah was Ahmose. More controversially still, it may also have been tied in with the approach of a rogue planetary body appearing in the sky close to the Sun, in the form of the fiery red Comet Typhon, or the Destroyer. I am Frank Rothe, a German hobby researcher, and I am investigating the Egyptian Pyramids and derived from these researches I have created a new model of the atomic nucleus (1). I agree with you, that the early earth was located at a greater distance from the sun as today. I have pointed out this in my 2002 book "Der Pyramiden Code". It is written in German and I don't know, if it is translated into English. There is an ancient text on the Shabaka stone (2), which leads in this direction. In this text, Geb is the supreme God instead of Ra and he rules over the battle Horus against Seth [For English translations of the hieroglyphic texts on the Stone, with analysis, see (3)]. When you see Geb as Nibiru, Horus as Earth and Seth as Mars, the text describes the changes of the orbits of Mars and Earth. In this battle Horus loses one eye (Earth's moon) and Seth both testicles (Mars' moons Phobos and Deimos). The text implies that this change happened as a well-planned artificial action of the gods. That means they could deal with gravity and play with planets! This is a hint, that Sitchin was right with his story of the Anunnaki. Only the time frame doesn't fit. The change of the orbits seems to have occurred billions of years ago, but the Anunnaki seem to have appeared on earth only 432,000 years ago. Thank you very much for your fascinating email, outlining the overlap between our research findings. I think that the potential difficulty about the time-scales that you write about need not be as big a problem as it appears - Sitchin's cosmology seems to have focussed upon events about 3.9 billion years ago, rather than during the period that the Anunnaki were actually here on Earth. So the battle you describe, with Geb as Nibiru, might have discussed a very early event, and that the cosmological story of that event was given to us by the Anunnaki rather like a scientific history lesson. Or, one might argue a more Velikovsky-like argument, where these major cosmic events occurred much more recently than science currently allows for. That's harder to envisage, but who is to say? That's a big debate right there, just as Velikovsky encountered within his own academic community. One of the books of Dr. Burgard is entitled "Encheduanna - Geheime Offenbarungen" (secret revelations). It is written in German and I possess it, the second edition from 2012. Encheduanna seems to be the daughter of Sargon I, and was a female high priest. The text has 42 parts and Dr. Burgard translated it with a new method. He put all possible meanings of the Sumerian words together and tried to find the correct meaning by putting the words in their correct context. His translation brings us to a very Sitchinite version of our history of the past. Temples are for him complexes of buildings for resting, for nutrition, serving as a newsroom, production building or flight control center. They had sender and receiver and the metal heads of the temple towers were antennas for somewhat like radio transmission. The Gods Dr Burgard calls decision makers. They had rockets and used acetylene, which can be produced from lime stone, as fuel. For the production of this fuel the decision makers held human people as slaves. The work was very hard and very dangerous. Dr. Burgard's book has more than 280 pages, all in German. Many thanks to Frank for this very useful information. I will continue to update about Dr Burgard and his work as I discover more. "On Tuesday, the B612 Foundation (2), which is devoted to preventing the next deep impact, will present data from a nuclear-weapons test warning satellite showing that far more asteroids have hit earth in the past few years than previously thought, the organization announced on its website. The data, collected from a nuclear missile detection system that picks up large blasts on earth, shows that since 2001, asteroids have caused 26 explosions on the scale of an atomic bomb. This issue has been raised a number of times in the House of Commons by Lembit Opik, who was a Liberal Democrat MP up until the 2010 general election. He has a passion for the subject, and still appears on debates discussing the threat. For a number of reasons, Mr Opik does not enjoy a lot of credibility in the U.K., so his association with this topic may not be as helpful as it might first appear. Nevertheless, the British Government have considered the threat officially, establishing a Task Force which produced a report in 2000 (3, 4), a copy of which I still have on my bookshelf. In 2005, Lembit Opik was still calling upon the Government to act upon the recommendations of their own report (5). It's highly likely that the U.S. Government is way ahead of the Brits on this. The question is how good is its capacity to spot these objects? Probably better than is publicly acknowledged, I would suspect. Perhaps the real question is what they would do with a "heads-up" in the event of the detection of a large space rock heading towards a city. After all, getting rid of the threat is presumably beyond our current capabilities - unless these things can actually already be intercepted in some way? "Ian O'Neill: So, this Planet X/Nibiru thing... how do I know you're not a part of a grand conspiracy...? Mike Brown: I don't get paid enough to be part of a conspiracy that big. Clearly, Mike was sharing a joke. But it is worth noting that there is a significant lead time between the discovery of a new outer solar system object, its verification with repeated observations, and the publication of an academic paper about the discovery itself (with its attendant press release). During that interval, which is perhaps 6 months or more, the astronomers involved have to keep everything under wraps - or run the risk of their rivals muscling in and publishing first!